There's a lot of dorm essentials on your college dorm checklist, and we hope it's on your phone or a sheet of paper and not all in your head, because it can be hard to remember everything! Okay, it's going to be hard to remember everything whether it's in your head or you have a physical list. Starting college is fun and stressful all at the same time, which means you may end up forgetting a dorm necessity at some point. A great way to start college out right is with value packs such as our All In One Power Strip Value Pack. Our All In One Power Strip Value Pack has everything you need for your electronics in order to start college right. You will receive a six outlet power strip with a 2.5 ft. cord, a wall adapter that turns one outlet into three outlets, and a 5 ft. indoor extension cord with three outlets. College dorm rooms unfortunately don't offer many electrical outlets and the ones that are offered are also shared with your roommate. You simply cannot go through the college year without adding extra electrical outlets. If you don't add extra outlets, you will find yourself rearranging your dorm room according to where the outlets are and crawling behind your dorm furniture to unplug what you're not using and plug in what you need. Doing this all year will be very stressful. 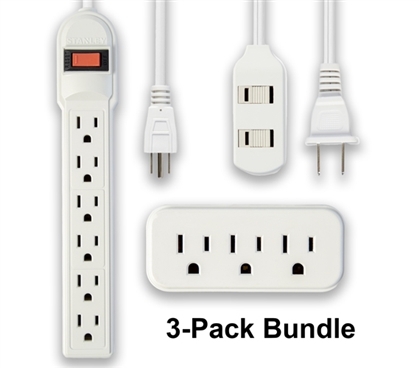 Eliminate that stress completely with our All In One Power Strip Value Pack that will provide all the college electrical outlets you need and more!